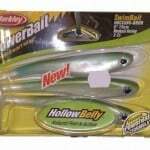 One of the most popular baits that are going crazy in the bass fishing community is the Berkley Hollow Belly Swimbaits. There are a lot of different versions of swimbaits on the market but through my experience the Berkley Hollow Belly out performs most of the other brands. A swimbait is very versatile soft bait that allows an angler to fish all types of water from weedy shallows to open deep waters. The reason I find the Hollow Belly to be superior over the other brands is because the bait is truly hollow throughout the body. This allows the bait to ripple down the entire bait giving it a real life swimming action. The slower the retrieve the more this bait looks alive. The Hollow Belly baits have a large paddle tail that gives them even more action to the lure. There are other soft swimbaits on the market that are not hollow and will not ripple; but just move side to side and they don’t look as real. They do work but not nearly effective as a hollow bait. How to Rig the Swimbait: This bait is popular because it can be rigged in many ways. The two most common ways to rig this bait is by weedless Texas Rig and with an exposed hook with a jig. Weedless Texas Rigging: When rigging the bait weedless I prefer to use a Mustad Power Lock Hook or some sort of bait screw lock hook. These hooks provide a bait screw that screws into the nose of the bait while running the hook into the back of the bait with the hook point running along the top of the body. Whether you’re using a one of these Mustad hooks or another hook type, ensure that the hook has a belly weight if you need to get it a bit deeper. The Mustad brand allows you to reposition the weight along the bottom of the hook to change up the way the bait moves. When fishing near the service through weeds you can rig this bait Texas rigged with a weightless hook. It is important that when choosing a hook type for Texas Rigging the swimbait that the hook point is directly in line with the hook eye. That way when setting the hook the full energy transfers into the hook set. The size of the hook should allow enough room to accommodate room for hook gap between the bait and the hook. This way the bait can collapse enough so the hook point drives into the fish and not the bait when setting the hook. Exposed Hook on a Jig: When fishing open water with no weeds or deep water, rigging the swimbait with a jig head can be very effective. Torpedo jigs or regular jig heads will work well. Simply run the hook through the bait’s body and allow the point of the hook to be completely exposed. How to Fish the Swimbait: Don’t pop or jerk the bait. Majority of the time slow and steady of a retrieve works the best. By reeling the bait slowly it allows the bait to do what it does best, ripple through the water life like. If you don’t get any hits change up the speed of retrieve before moving. Reeling and stopping, reeling and stopping will sometimes ignite the fish to bite the bait. Where to Fish the Swimbaits: As I mentioned above the swimbaits are very versatile bait. You want to fish these baits around natural areas where bait fish will be present. – Land breaks creating shore points in the water. – Any humps of structure such as submerged boulders. – On the edge of weedlines. – Ledges and drops from shallow water to deep water. – Docks! Skip the bait under the docks or along side of the dock. – Edge of lilly pads and other groups of vegetation. All of these areas are spots that bass will be nestled down waiting to ambush bait fish such as shad, perch, sunfish and pumpkinseed. 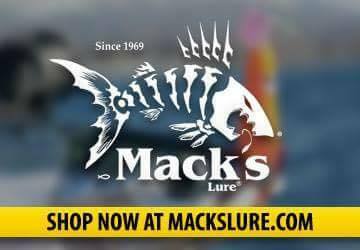 Try to best match the type of swimbait to which type of bait fish that are in the area. 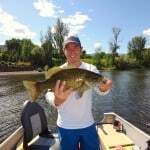 The size of swimbait depends on the size of bass that you are targeting. In BC I find the 4 inch bait works well. In heavy cover such as weeds I like to use perch or pumpkinseed colour type of swimbaits. In more open water and weedlines I like to use more of a shad or white colour. Utilize lake maps, depth charts and your electronics to identify types of structures. Try to do this before getting on the water so you don’t spend majority of the day searching for key areas that may be holding fish. 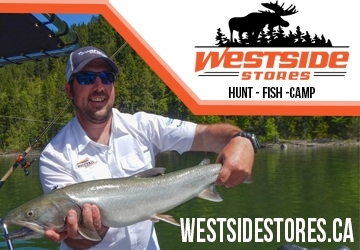 If you come to an area on the lake that offers excellent structure and you don’t get any action, it doesn’t necessary mean that there are no fish there. The bigger bass take the better spots. Change up your presentation before leaving, you might just be throwing something that their not interested in. Big bass don’t need to eat all the time, if you don’t get any luck early in the day come back to the spot later on and you may just entice the fish to bite. 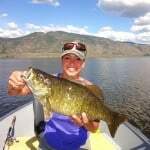 This spring I have utilized the swimbaits in Osoyoos Lake working the weedlines for Smallmouth Bass. 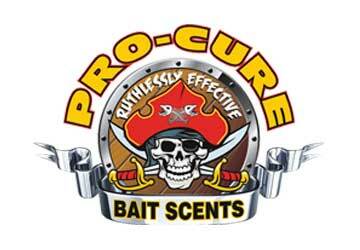 These baits have proven themselves over and over! I find the fish hit these baits very hard! I like to fish these baits with a longer heavy 7 foot rod which allows me to make long casts. I prefer to use a braided line as it eliminates line stretch to allow for a strong hook sets and to reel in the fish through heavy vegetation. In open water fishing I will use Berkley Vanish Flurocarbon 12-14lbs test. If you are fishing lakes with bigger bass you may want to increase the pound test. 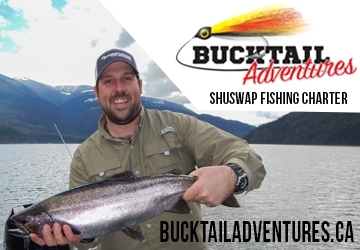 The next time you are out on the water targeting some BC Bass give the Hollow Belly Swimbaits a try, you won’t regret it! 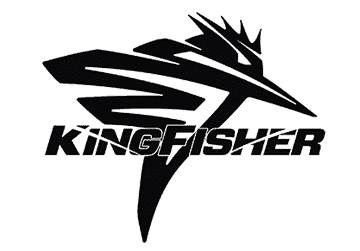 Don’t forget to email us your pics or post them on our BC FISHN Facebook page. 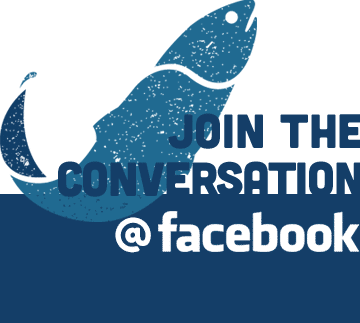 Tight lines & Conserve our Waters!